Since the late 1970s, the search for new phenomena using monojet events has attracted the attention of the scientific community. Such a simple final state, with one jet of hadrons and nothing else, could turn out to be crucial in revealing the presence of new phenomena beyond the Standard Model. No doubt the nature of dark matter is one of the big open questions in modern particle physics. The observations of the orbital velocities of stars in galaxies and galaxies in clusters show a discrepancy between the total mass (as inferred from their gravitational effects) and that calculated from the observed distribution of light. Such a discrepancy has been known since the 1930s and cannot be accommodated with non-luminous, ordinary matter. In order to account for this "missing" mass, physicists postulate the existence of dark matter, a new kind of matter that doesn’t emit or absorb light. The favorite candidates for dark matter are WIMPs, or weakly interacting massive particles. The monojet analysis has always been considered the golden channel in the search for WIMPs at colliders. Monojet final states also provide unique access to the search for supersymmetry in very mass-compressed scenarios that involve the presence of neutralinos in the final state, considered as the preferred dark matter candidates in many supersymmetric models. In 1998, new ideas to explain the weakness of gravity led to the revolutionary concept of Large Extra Dimensions (LED). In this model, the graviton (the particle acting as mediator of the gravitational interaction) could be produced in association with a jet of hadrons. The graviton would propagate in the extra dimensions - thus explaining the apparent weakness of gravity at our microscopic level - and only one jet of hadrons would be observed in our four-dimensional world. This could cause, once again, an excess of monojet events at colliders. As the LHC began taking data in 2009, searches for new phenomena in monojet final states returned to the spotlight. It was commonly believed that jet-related measurements at colliders could not achieve experimental precision better than 10-20%. The ATLAS monojet team has shown how a carefully designed event selection strategy, together with the use of data-driven techniques in constraining the irreducible backgrounds, translates into extremely precise background predictions. Ultimately, this results in unanticipated sensitivity. Searches for new phenomena in monojet events were carried out in proton-proton collision data at 7 TeV and 8 TeV in Run 1. 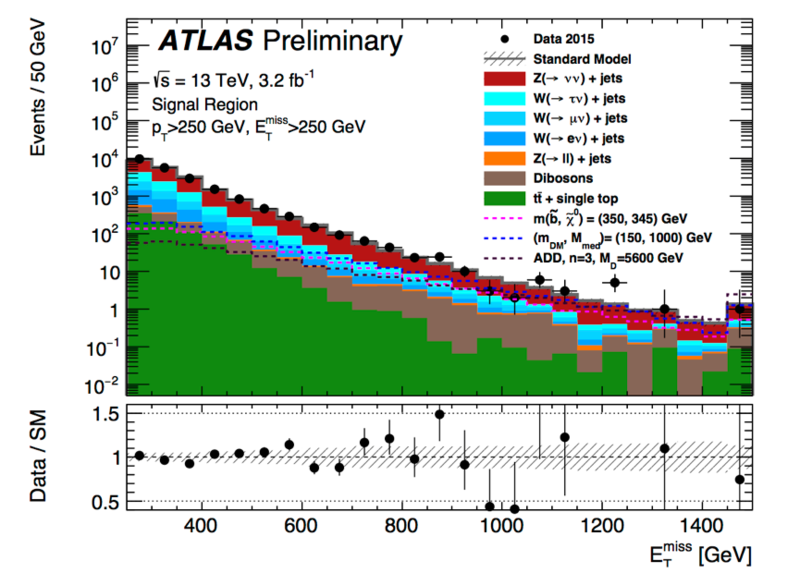 ATLAS scientists have just released a new publication with results based on an analysis of the early Run 2 data collected in 2015 using 13 TeV proton-proton collisions. The high energy in the collisions boosts the sensitivity of the analysis. Good agreement is observed between the data and the Standard Model background predictions. The results have been translated into LED, WIMP and Supersymmetry exclusion limits that already supersede previous Run 1 results. Over the next three years of Run 2, the ATLAS experiment will collect a data sample at least twenty times bigger than that used in this analysis. A new era in the search for new fundamental physics is about to open and monojet searches will continue to play a central role.